The latest LEGO® Ideas set 21314 TRON: Legacy is available from March 31, 2018 priced £29.99/ US$34.99/ 34.99€. 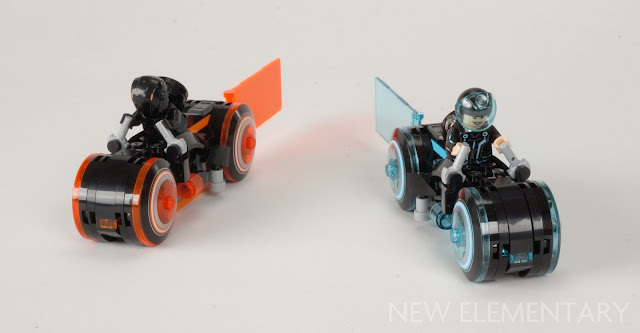 It depicts the iconic race between two light cycles and is based on the 2010 film which is a sequel to the technically ambitious 1982 original. The original submission, by fans BrickBrosUK from Devon, proposed one light cycle and minifigure. Even though this has been expanded to include another light cycle and two further minifigures, it's still a small set at just 230 pieces. And of course, you are building the same vehicle twice. Thankfully it's an ingenious build; clever in its compactness and some interesting connections. But as ever, we are here to discuss the parts! The transparent colours look superb against the black. Transparent Light Blue is an extremely common colour these days so I didn't expect to find pieces newly cast in this colour but did hope for some in transparent orange, of which there are actually two shades used in the set: Transparent Fluorescent Reddish Orange and Transparent Bright Orange [TLG]/ Trans-Neon Orange and Trans-Orange [BL]. 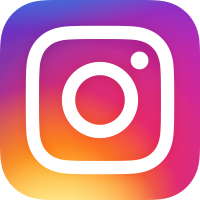 (Fun colour nerd fact; the former has been around for a decade longer than the latter.) Anyway; it turns out that many elements I hoped might be new, are not. For example those banner flags (Design ID 30292) at the rear which represent the lethal streams of emitted light: the Transparent Light Blue has been in eight sets, although none since 2013 (consequently it now has a new Element ID, 6234182), and the Transparent Fluorescent Reddish Orange (6120915) was in four NEXO KNIGHTS sets, a line that has revitalised this hue of late. I was blown away by Sam Flynn's headgear but turns out his elegant transparent visor is not a new mould nor new to this colour (in fact I even own some!). It is Space Visor Tr (6021936|89159) which has been in 6 sets, initially 76000 Arctic Batman vs. Mr. Freeze: Aquaman on Ice in 2013 and also used in the LEGO CITY Deep Sea Explorers subtheme in 2015. As for the opaque blue and orange parts, at least there are a couple of rare universal pieces here. Best is the 1x8 plate in Bright Orange [TLG]/ Orange [BL] (6210029|3460) which has not been seen since its initial run from 2001 to 2003. Surely this will help bring the hideous third market price of this useful piece down, although the set contains only one. 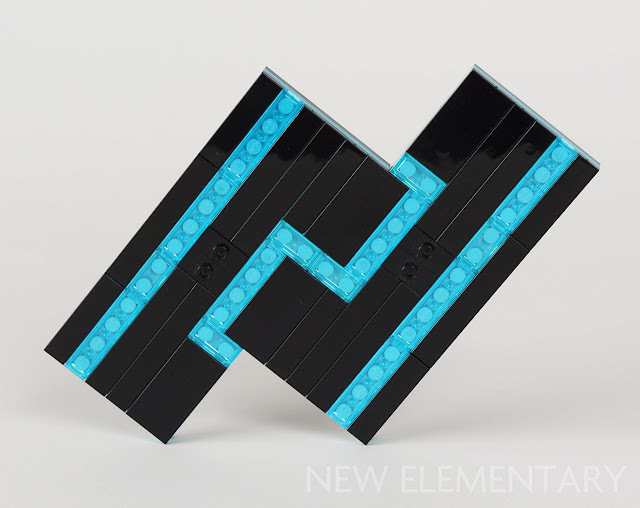 There are two Plate 6x10 in Medium Azure (6133692|3033); an element which only comes in the 2017 sets 41315 Heartlake Surf Shop and 70620 NINJAGO City so far. These are used to create the segment of "the Grid" upon which the bikes are raced, which looks quite effective and dynamic. So through New-Elementary-tinted glasses, there's not a lot of parts excitement in this set; the only exclusives being the decorated elements. 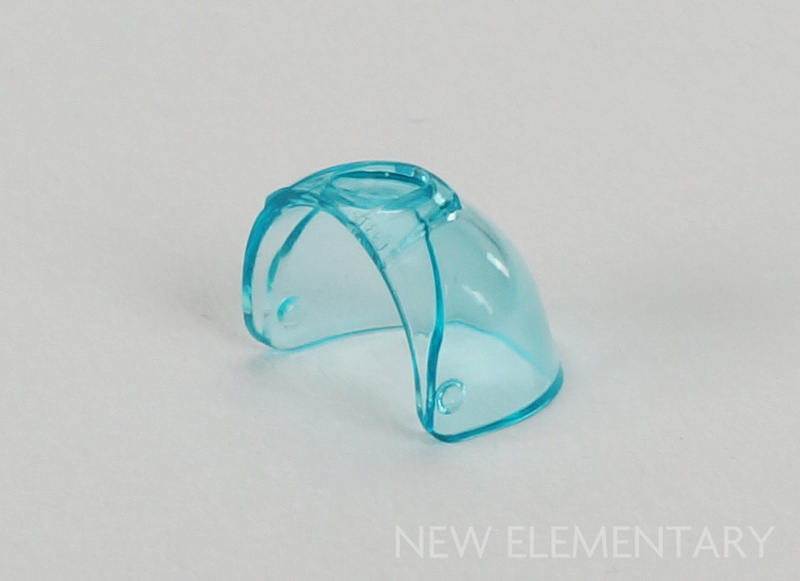 Most prominent are the 4x4 dishes that form the wheels; obviously there are four of each, in Transparent Light Blue (Element ID 6228444) and Transparent Fluorescent Reddish Orange (6228443). These should have been the highlight of the set but sadly, they drive me crazy. The printing is not calibrated correctly and so the concentric circles are off-centre. My blue ones are better than the orange; hopefully yours will all be perfect. 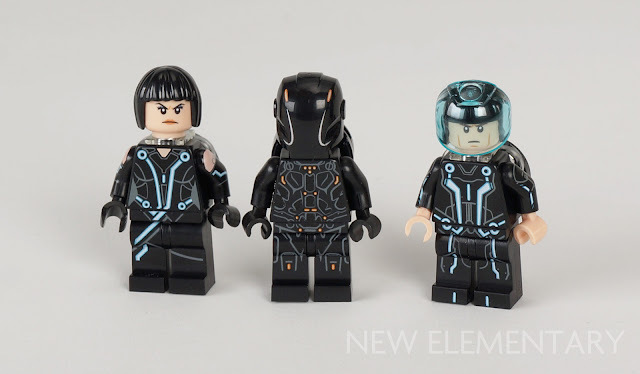 Of course, the minifigures all have exclusive printing and they're beautiful; I especially like Quorra's exposed shoulders. 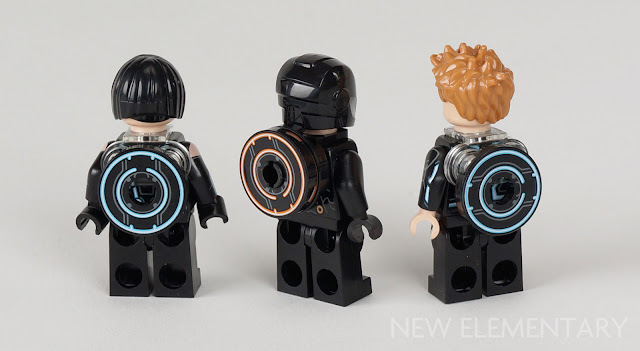 Of the three minifigures provided in this set, only Rinzler was happy about being photographed. 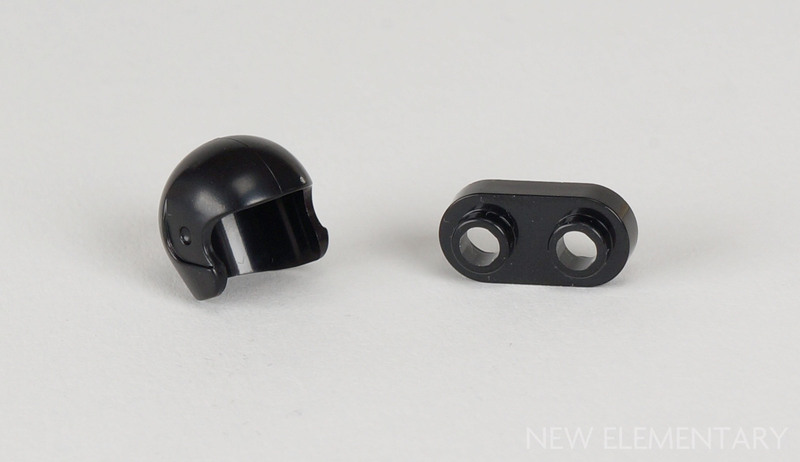 So with this set we now have this generic superhero helmet in Black. With no traditional eye slits, it's perhaps abstract enough to be used for other purposes such as architectural details or bits of spaceships. Or Daft Punk MOCs. Perhaps to keep Cambridge Analytica's hands off their data, Sam and Quorra carry their 'identity disc' - 2x2 'doughnut' tiles with blue printing (6228441) - on their back, thanks to the transparent neck bracket with two studs and rounded corners (Element ID 6166106|Design IDs 18986/28656). 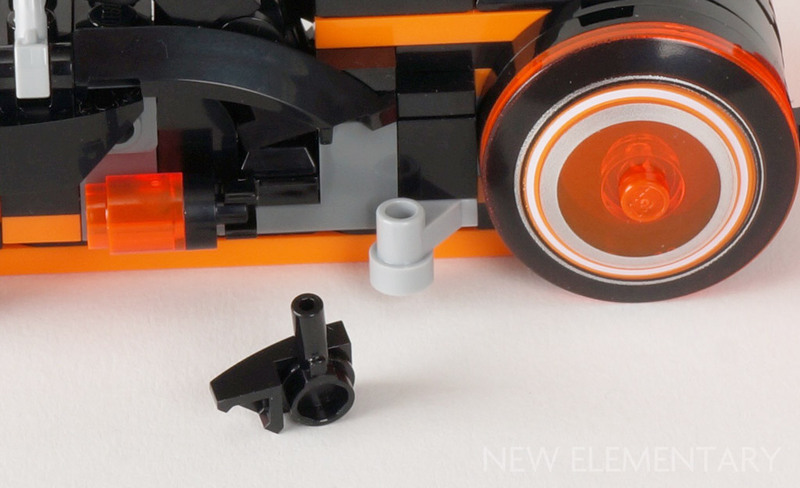 As per the movie, Rinzler carries two discs in orange (Element ID 6228439) and consequently requires the neck bracket with a Technic pin (Element ID 6003478|Design ID 48724) to attach these. 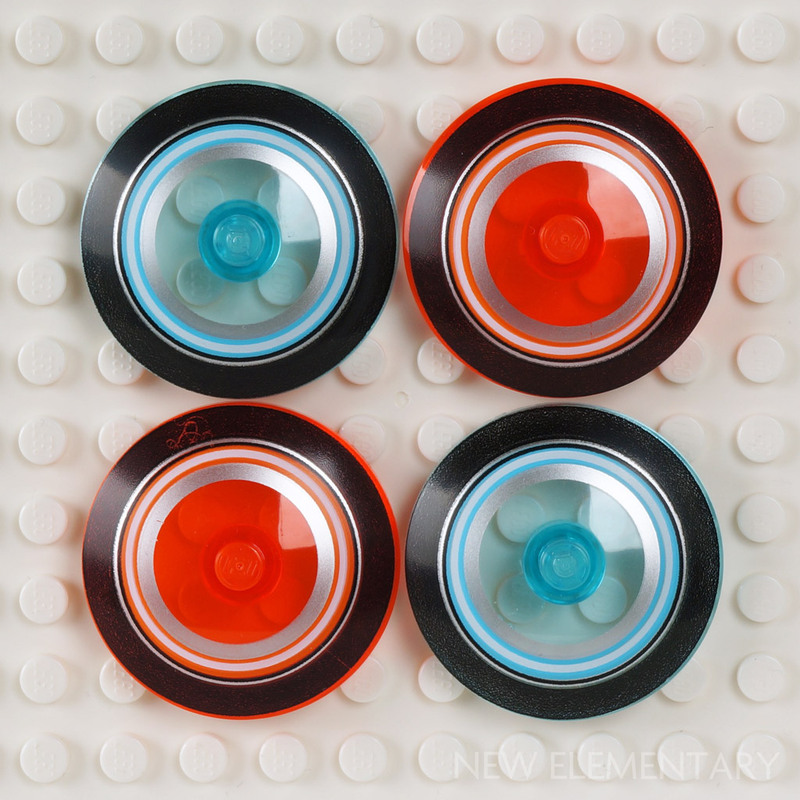 The identity discs look fantastic and will make for great detailing in the right MOC. In fact you can already give this a whirl in Mecabricks as they've been added already. These elements trump those misaligned wheels for the honour of being my favourite elements in the set! I mentioned Sam's visor; under that is his helmet (6217663|93560) which is the football helmet introduced in 2011. Happily, Black is a new colour of this part for 2018 and also comes in 70642 Killow vs. Samurai X. Also in Black and new for 2018 is the 1x2 rounded plate which Simon Liu examined in January. Tron contains four (6210270|35480) and utilises them on the chassis, where their hollow studs allow for the required offset. I noticed there was a good array of not-new-but-recent Black parts in this set, so if you still don't own any of these this might make the set more attractive. Pictured below are the round 1x1 with vertical bar (Design ID 20482), wedged baby bows in left (29120) and right (29119), the 'padlock' plate (26047) and the round 1x1 with horizontal bar (32828). Two of these parts are used in an interesting way. As seen below, wedges are attached to round 1x1s with horizontal bar and inserted into the grey hole. This allows the wedge to be rotated on two axes, essentially meaning it can be positioned completely off-grid, if you'll pardon the pun. 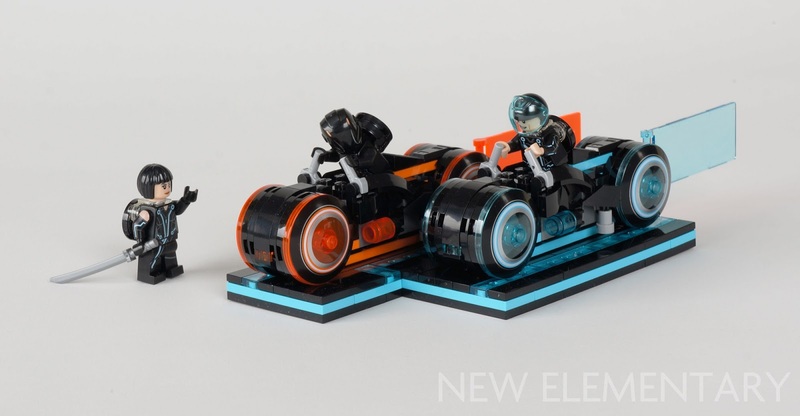 If you're not a fan of the TRON films there's probably not much for you here – it feels unlikely that you'll be buying a set this small at recommended retail price but perhaps some of those printed parts are exactly what you've been looking for. The misaligned printing on the wheels was a big negative for me, especially as the designers went to so much trouble to have wheels that actually turn (the original submission did not). You may consider my concern to be obsessive but if you specifically had your eye on those dishes as something you could use in your own builds, it's an important consideration before you fork out money. Price and printing concerns aside, it's a glorious set to display and has great vroomability. 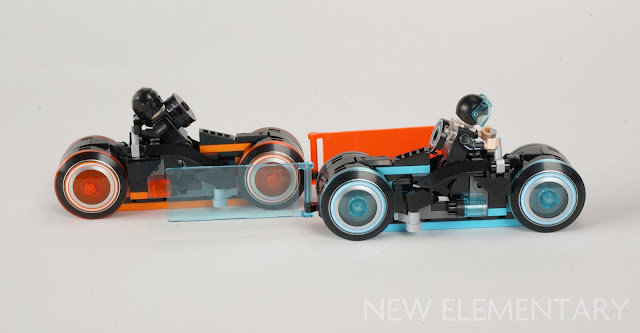 The design of the wheels, using curved slopes in the middle, is ingenious and while the build is brief, it's satisfying thanks to the quality of the light cycle build. 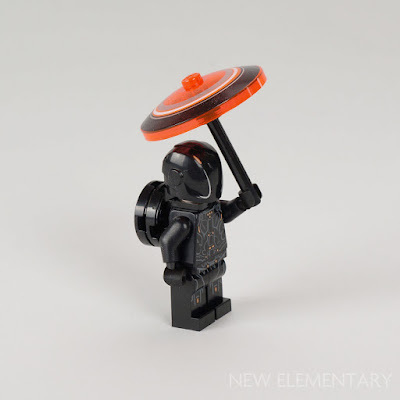 If you want to read a set review, visit our friends at The Brick Blogger, Brickset or The Brothers Brick and for some truly glorious photography of the set check out Stuck in Plastic. 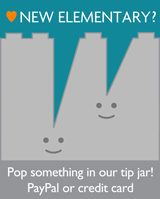 Donate an amount of your choosing to help keep New Elementary publishing great articles about LEGO pieces. Why am I asking for money? Read more here. 1. that it's a Technic plate because the ends are rounded which is a detail that has only ever been used on 1x Technic plates before. 2. that it's _not_ a Technic plate because, well, there's really nothing about it that's designed to work with the Technic system, where all the 1x Technic plates had axle holes, pin holes, and/or toothed ends that were designed to interact with the old toothed half-bushings. I know New Elementary isn't really about actual set reviews, but it's mildly disappointing to see yet another review that doesn't cover one detail that's been mentioned but, as far as I've been able to determine, never shown. Word is that the base can be rearranged into a different shape for the disc battle scene, but where I thought I had an idea of how that was done, now I can tell it's impossible due to the 6x8 plates. You mention parts in both shades of trans-orange. Which parts come in Trans-neon orange that glows under UV light, and which come in the newer trans-orange that doesn't? The wheels look like they're TNO, but the text indicates that they're the non-fluorescent shade. And bummer that they're not all TNO. On a guess, the 1x1 plate used as the headlight is regular trans-orange, since they've used that in 149 sets already and never once released it in TNO. The "wheels" certainly looks like they're Transparent Fluorescent Reddish Orange and not Transparent Bright Orange as written in the review. I bought the set earlier today from the Dreamworld LEGO store here in Australia. Using the part numbers from the back of the instruction book I can confirm 100% that the 1x1 round brick and flag are trans-fluro-orange and the 1x1 plate is trans-orange. The wheels aren't listed in the TLG database yet but looking at the part next to some other parts (an unprinted trans-fluro-orange 4x4 radar dish and an unprinted trans-orange 3x3 radar dish among other things), the wheels do look to be trans-fluro-orange to my eyes. Okay, it's pretty much what I figured. Juggle a couple tiles and you can slide the two sections together. I'm not sure I like how it looks, but it's always possible to redo the tile pattern. Couple notes on this after having bought and built two copies. One is that the trans-orange 1x1 plate appears to be only one copy per set, missing the usual extra part in case the first goes missing. I thought maybe I dropped it with the first copy, but I checked very carefully for it in the second and found it to be absent. 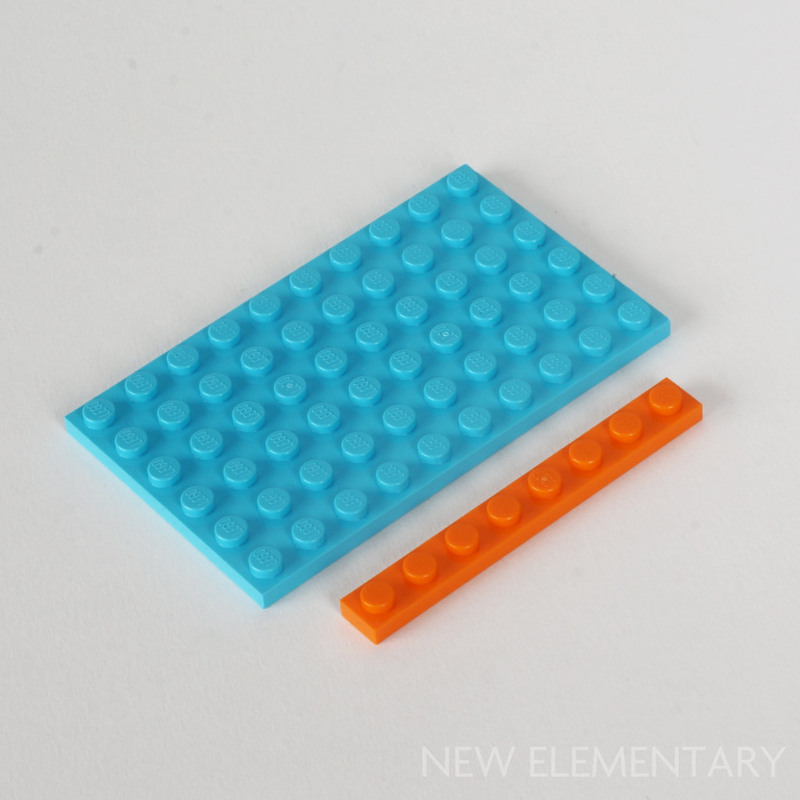 This is echoed by the Bricklink inventory, which lists an extra of the 1x1 plate in trans-light blue but not trans-orange. 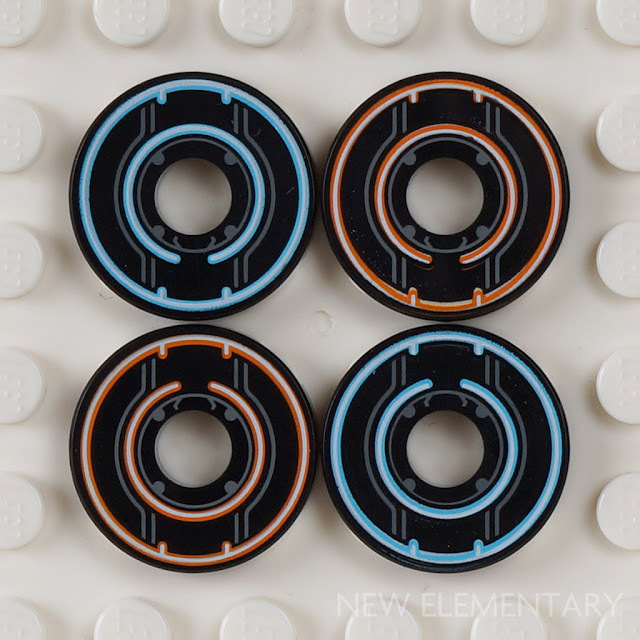 While the two identity discs on the left are nearly centered, the ones on the right have silver that is _way_ off-center compared to the colored background. Ironically, that's more noticeable than the off-center print on the radar dishes once the model is built. The black round plates behind the dishes swallows up the exposed edge on the dish due to being black. If they'd been built on any other color, it might be more obvious. I can't really tell how bad my radar dishes might be without pulling them all off the four lightcycles, but fortunately for me, I only have one identity disc out of eight that's noticeably odd looking. Unfortunately for me, it's a blue one, where I could have just hidden the bad one if it was orange. Well, I plan to pick up at least one more copy in case I decide to build Quorra's Lightrunner, so hopefully I'll snag at least one more blue identity disc with a decent print.